Georgia coaches are hoping to reverse some "bad luck" in getting top notch offensive tackles to choose the Dawgs. Personally, I have a hard time blaming it on bad luck when it's starting to feel more like our lot in life. That is not to say that Georgia has not been in the running. It seems as though the Bulldogs are always in a two- or three-team race for a top lineman on signing day. This year, they lost Laremy Tunsil to Ole Miss. The year before, Avery Young jilted the Bulldogs to play for archrival Auburn. On signing day 2011, Antonio Richardson decided to stick with the in-state Volunteers, and he started all 12 games for Tennessee last season. Much of Georgia's ill-fortune can be attributed to the fact that the Peach State does not produce a lot of highly ranked offensive tackles. Since 2006, the state of Georgia has had three offensive tackles ranked in the ESPN 150 -- Justin Anderson, Ja'Wuan James and Brandon Greene. 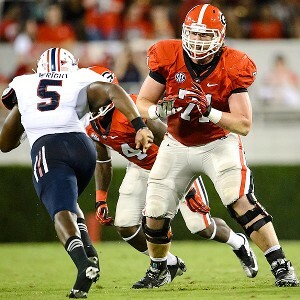 Looking ahead, only one tackle on the ESPN Watch List for 2014 hails from Georgia:Orlando Brown (Duluth, Ga./Peachtree Ridge). Four top prospects in eight years do not exactly indicate a hotbed. And the prospects of Orlando Brown becoming a Georgia Bulldog are between slim and none. So once again we'll be looking outside the borders for offensive tackle depth and talent. Add to the recruiting hurdles the Hugh Freeze effect, injuries, coaching changes, position juggling between offensive and defensive lines, more injuries and the numerous guys that just didn't pan out and you've got what feels like Fate hammering you in the depth chart, repeatedly. Thank God we offered Nathan Theus a scholarship. But regardless of the semantics with which you view the situation, Nabulsi gives a great run down of the prospects we are focusing on. They all have great things to say about the Georgia Bulldogs at this stage of their recruitment. Can they add their signature to that sentiment next February? We'll see what Fate allows.